On Sunday May 17, 2015, a violent biker gang brawl broke out at the popular “breastaurant” Twin Peaks in Waco, Texas. When the dust settled, 9 were dead, 18 seriously injured, and 170 or so were taken into custody. Justice of the Peace, W.H. “Pete” Peterson, set the bail amount for every biker taken into custody at $1million. In so doing, Judge Peterson justified his decision in stating, “I think it is important to send a message. We had nine people killed in our community. These people just came in, and most of them were from out of town.” Message received, Judge. And that message tells me that magistrates will be swift and decisive…due process and procedural rights be damned. Now don’t get me wrong. The violence that resulted in 9 deaths demands swift and, if necessary, harsh judicial action. But a blanket application of a $1million bond to 170 people could not have afforded each of those people an independent evaluation. Bail is intended to ensure that the defendant will appear for further court proceedings, it is not intended to punish people who have yet to be convicted of a crime. Texas Code of Criminal Procedure 17.15 sets the rules for fixing a bail amount and “sending a message” is not among them. What is among the rules for setting bail is the family’s ability to pay the bond amount in cash or through a bondsman, which is typically 10% of the bond. That means that each biker’s family would have to cough up $100,000 cash in order to post bail through a bail bondsmen. I have not conducted background checks on these bikers but I’d bet my daughter’s college fund (also not close to $100,000) that almost none of these families have the ability to pay what the judge ordered. 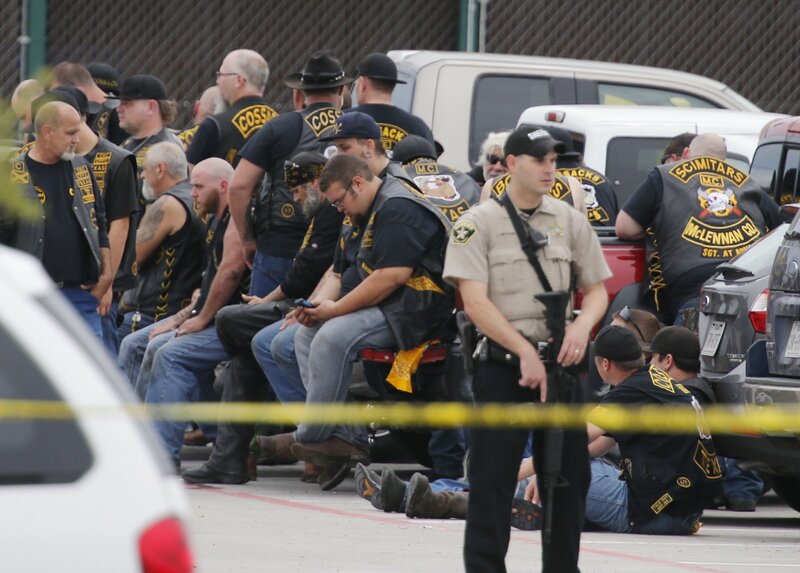 So for most of these bikers, the $1million bond amount is the same as no bond at all. So What? First, it’s not entirely obvious that all of these people were breaking the law that day. Waco police spokesman, Sgt. Patrick Swanton, told the Associated Press that “they were not here to drink and eat barbecue.” Keep in mind that Twin Peaks does serve beer and barbecue, quite regularly. Also, according to the AP, 115 of the 170 arrested had no criminal record in Texas and that at least one of the biker victims, Jesus Delgado Rodriguez, was a veteran who was awarded the Purple Heart. So let’s not be too quick to lump all of these guys in the same send-a-message category. Let’s at least leave open the possibility some of the 170 arrested may have actually been there to drink at eat barbecue. Second, the high bond amount will have the opposite effect that Judge “Pete” Peterson intended. The myriad of bond reduction hearings and appeals that will follow will cause the courts in McLennan County to drink from the proverbial firehose. Defendants can challenge the bond amount by a motion to reduce or an application for a writ of habeas corpus. If the court denies the habeas application, the defendant can immediately appeal. So the courts may be stuck hearing interlocutory appeals for many weeks to come. As with any other clogged government pipeline, it will come down to lots and lots of money. Most of the defendants will require public defenders or appointed counsel. And, for now, ALL of the defendants are being charged with engaging in organized criminal activity leading to capital murder. Such a serious charge will take lots of time and lots of money. And everything will be pushed to the side until these initial bond amounts are handled. The $1million bond applied to each of the 170 violates Texas procedural rules but it happened anyway. This is not the first time that an elected official took it upon himself to “send a message” but it is certainly receiving attention from the media and pundits like me. And you should care because this kind of thing happens all the time. And if it happens to you, it’s likely that the media won’t be shedding light on your case. All you will have in your corner is me, Dallas criminal defense attorney, and my respected colleagues of the defense bar who do battle in these trenches everyday.